Apply to work with David this summer! B.J. Hollars: Your memoir and nonfiction writing transcends a range of topics, from collegiate swimming, to personal tragedies, to parenthood. Do you find that subject matter changes your writing style or process? Does subject dictate form for you? David McGlynn: That’s a shrewd observation, and absolutely true. Yes, subject dictates for me. My stories and essays (and especially the nonfiction) come from individual images or moments that, for whatever reason, cauterize in my mind. The narratives grow around those small, shining moments. When those moments are funny – for example, when they have to do with parenting energetic boys – the piece will be funny. When the moment is sad or tragic – as when writing about the murder of my friend – the story will be sad, too. I try to follow the momentum of that initial image as far and as fully as I can. BH: In A Door in the Ocean you recount your swimming career amid the backdrop of your own coming-of-age, as well as the death of your friend and swimming teammate. The book is riveting, and highly personal. How do you decide which parts of yourself to share, and which parts of yourself to leave out? DM: Deciding “how much of yourself” to put into a project is the classic memoirist’s dilemma. We want to reveal enough to make the story interesting and compelling, but not so much that we’re exposed to the point of humiliation. I try to ignore the second part of the dilemma as much as I can. Over time, I have come to believe that there isn’t much a writer can say that hasn’t been said or experienced by other people before. Maybe it’s a product of having come of age in the 1990s, when everyone, it seemed, was writing a tell-all salacious memoir about an array of once-taboo subjects. But it’s often the case that revealing what feels like our worst secrets doesn’t amount to the lightning strike we think it will. And, in my experience, readers tend to appreciate a writer willing to be real. So I say, be real! Let it all hang out! String your dirty laundry on the line for the world to see! You can always take it out later if you feel you’ve gone too far. Chances are, you’ll quickly see that every other window has dirty laundry hanging in it, too. 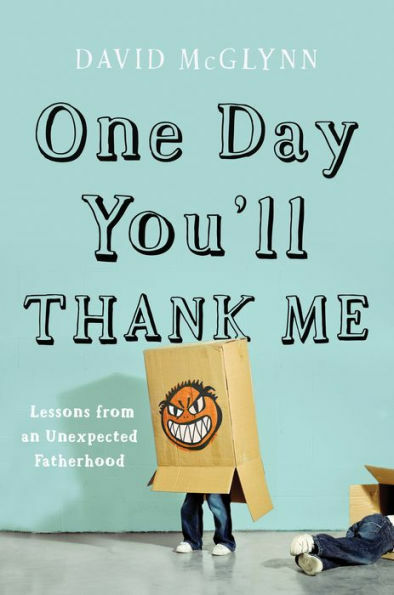 BH: In One Day You'll Thank Me: Lessons From an Unexpected Fatherhood, you reflect both on being a father and a son. What did you learn about these dual roles in the writing process? Any surprises along the way? DM: Meditating on fatherhood and son-hood was integral to One Day You’ll Thank Me. I don’t think any parent can think about his or her role as a father or mother without also considering their own experiences being parented. Writing about my relationship with my dad, while at the same time writing about my relationship with my sons, taught me to be gentler and more compassionate toward my father, and to take myself less seriously. My dad was trying the best he could; as a dad, I’m only doing the same thing. As far as surprises go, I was certainly struck by how fiercely I still love spending time with my father. I hope – and since my oldest is now a teenager, this is no guarantee – that my own sons will one day want to spend time with me. BH: At this summer's Priory Writers' Retreat, you'll be teaching a workshop that explores navigating the "treacherous waters" of turning life into stories. How do you know when a real-life occurrence is story worthy? DM: A story is worthy when it produces an image that sticks in your mind. When it’s the kind of moment (and it doesn’t have to be big) that you’d tell at a dinner party or around a campfire – when it’s one of the moments or experiences that makes you you. The experience may be cataclysmic or it may be totally pedestrian, nothing more than a quiet moment that struck you. The art of the story is in the telling, not in the moment itself. Learning to pay attention to the details and to make the experience come alive is the thing. BH: Finally, what are you working on now? DM: I’ve been neck-deep in a novel project for the past several years. Like One Day You’ll Thank Me, it’s about parenting – only instead of a funny send-up about parenting boys, the novel is about caring for children who are sick and the strains and sacrifices their parents must make. I’m hoping to see it come to fruition in the next several months. Want to work with David this summer? Click the button below to apply!